Belgium suffered heavily in the First World War. The German invasion of early August 1914 led to atrocities such as the Battle of Yser. Even more shocking was the German terror aimed at civilian targets, which found its culmination in the destruction of Louvain at the end of August. German troops shot more than 200 civilians and set fire to the old city centre, including the Medieval Clothiers’ Hall (Lakenhal), which was home to the university library. A thousand manuscripts, eight hundred incunables and 300,000 books went up in flames. The great fire destroyed four manuscripts from the Leiden university library. At the end of 1913 they had been lent to Leuven at the request of the scholars Lecoutere and Reypens. One of the manuscripts (formerly LTK 343) contained texts by the Brabantine mystic Jan van Ruusbroec (1293–1381). This codex, now sadly lost, was made around 1463 in the Groenendaal monastery close to Brussels, where Ruusbroec had been prior for many years. Thanks to pre-1914 research on Jan van Ruusbroec in Belgium, however, we are lucky to have preserved a great deal of information about this codex. The palaeographer Willem de Vreese had made a detailed description in his work De handschriften van Jan van Ruusbroec’s werken (1900–1902). Leoncé Reypens, editor of Ruusbroec’s works, had prepared a transcript of the text which is now in the library of the Ruusbroec Society in Antwerp. 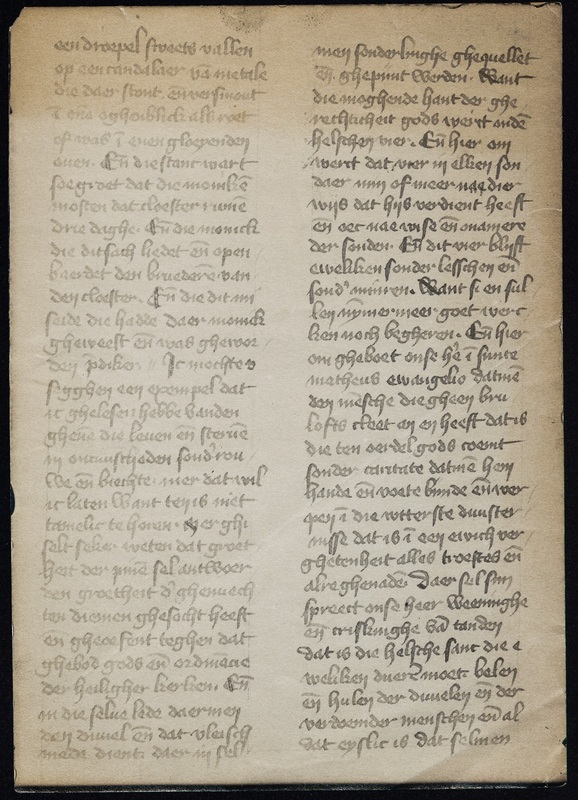 Finally, a photographic reproduction of a single page from the codex is preserved in the Bibliotheca Neerlandica Manuscripta, Willem de Vreese’s documentation of Middle Dutch manuscripts, which is kept in Leiden University Library since 1938. This photograph is shown here, a hundred years after the great fire of Louvain.